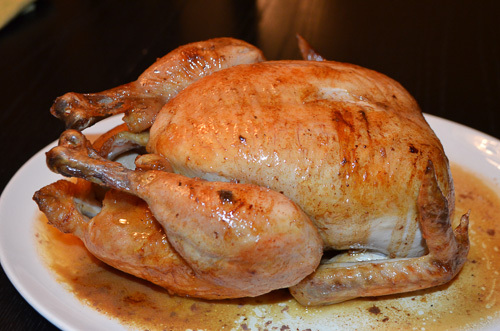 Poulet Roti is the French version of roasted chicken. This traditional French food is served at many a dinner table in France. One version is very easy to prepare and the other will take more effort but produces a crisp outside and a delicious and juicy inside. Version one is the quick and easy recipe. 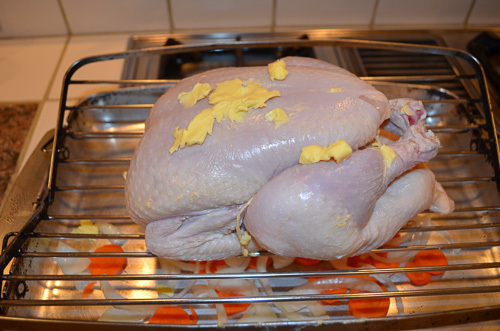 You just put the bird on a shallow baking dish, put it in the oven for one hour, take it out and let it rest for 15 minutes. When you're really busy this is the way to go. And I've done this version many times. But, this time around I thought I'd give the basting and turning version a try (aka the Perfection Method). Just between us I didn't really like roast chicken and hoped this would me a lover of it again. I am now a convert! It's the most classic version of Poulet Roti. Add to that the traditional sauce and you have the most delicious roast chicken you'll ever taste. 2. Sprinkle inside of chicken with 1/4 tsp salt. Smear inside with 1 Tb butter. 3. Truss chicken. Dry the outside thoroughly. Rub with 1 Tb. of butter. 4. Place chicken breast side up on the V-shape rack in the roasting pan. Scatter the onion and carrots in the bottom of the pan. Set in the middle rack of oven. 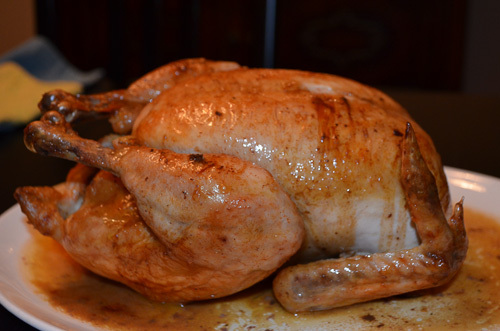 Brown breast side up for 5 minutes. Turn on right side for the last 5 minutes. After each *turn, baste with the butter and oil. This must be done quickly so oven doesn't cool off. *turn chicken by inserting a large wooden or metal spoon into the cavity, at other end use paper towels to protect your hands from the heat. 6. Reduce oven to 350 degrees. Leave chicken on its side for 25 minutes. Baste every 10 minutes. When basting oil runs out use fat from bottom of pan. 7. Halfway through total cooking time (in this case after 25 minutes), salt chicken and turn on its other side for 25 minutes. Continue basting. 8. Salt again and turn breast side up for the last 15 minutes. Continue basting. 9. When done discard trussing strings and let rest on a warm platter (or keep in the turned off oven with door ajar). 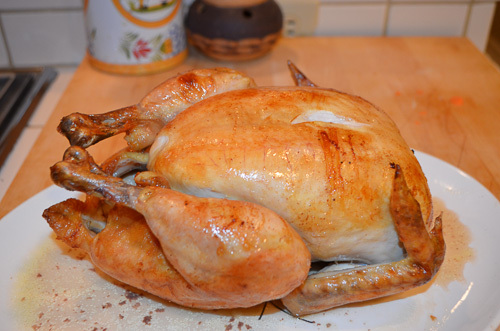 Resting allows the chicken to relax and the juices to retreat back into the meat. 1. Strain out onion and carrot. Remove all but 2 Tbs fat from the roasting pan. 2. Stir in minced shallot and cook slowly over stove burner for 1 minute. 3. Add stock and boil rapidly scraping up bits from bottom of pan. Let liquid reduce to 1/2 cup. 5. Off heat swirl in butter. Pour a spoonful of sauce over the chicken. 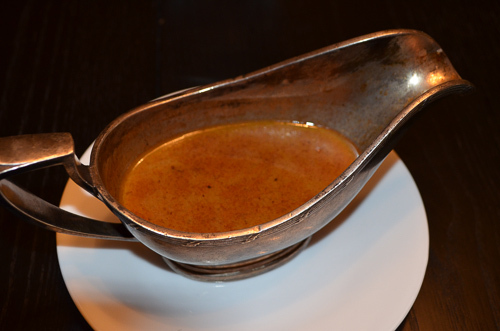 Put the remainder in a gravy boat and serve at the table. This is traditionally garnished with a sprig of watercress. You can serve with potatoes or brown rice (riz complet) and a green vegetable and/or green salad.